Gioachino Rossini’s works in the opera seria vein are rarely given. Everyone knows and loves The Barber of Seville and perhaps even Cinderella and Italian Girl in Algiers. In great productions, some of these comedies can be truly profound such as The Turk in Italy, recently seen in Los Angeles in the Hamburg State Opera version. 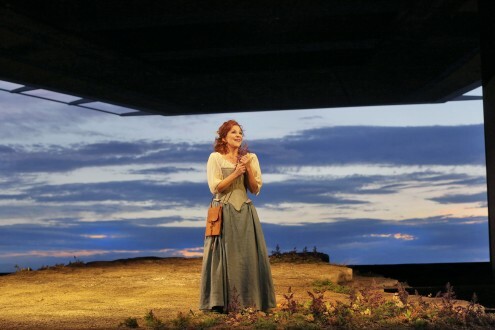 Santa Fe Opera—again and again—has provided the opportunity to reassess the composer’s serious works, and this season they have given us a terrific production of La donna del lago. Based on Sir Walter Scott’s poem, The Lady of the Lake, this co-production with the Metropolitan Opera represents one of the few ever stagings of this work in America. It follows in the company’s proud tradition of presenting historical rarities, often in American premieres. Further, it is a proud vehicle for arguably today’s greatest Rossini mezzo-soprano, Joyce DiDonato. These are huge shoes to fill, Marilyn Horne having previously held the title. I can attest to this, being fortunate enough to have heard her numerous times as a young operaphile (including a knock-out 1990 performance at Santa Fe as Gluck’s Orfeo). In fact Horne largely introduced modern American audiences not only to bel canto singing but to La donna del lago itself, first in a staged 1981 Houston production, and then in concert version at Carnegie Hall in November 1982. I have fond memories of hearing Horne bringing down the house that evening with her rendition of Malcolm’s aria, “Mura felici,” “O happy walls”—her coloratura seamlessly plumbing the depths and cresting in sparkling high-notes. Since that concert performance, the opera has been heard in the U.S. only once, in a modest production at New York City Opera in 2007. Heard in its third performance on the 26th July, the opera is set in 16th-century Scotland. On Lake Katrine lives the fair Elena (Ellen), daughter of Douglas, whose laird is Roderick (Rodrigo). The Scottish King James V (Giacomo) is separated from his hunting party and comes upon said fair maiden. A love quadrangle ensues, as Elena loves Malcolm but is promised by her father to Rodrigo, but is also loved by the king incognito as Uberto (Hubert). This turmoil in set within the context of a Highland/Lowland conflict. The Highlanders led by Rodrigo are eventually defeated by Giacomo V, who because of his love for Elena, forgives Douglas and gives Malcolm Elena’s hand. This heady mix of Romantic sensations and bel canto-era complexity (both in terms of vocal style and libretto) from 1819 was prescient, predating the most famous bel canto opera also set to a Scottish tale by Sir Walter Scott—Gaetano Donizetti’s Lucia di Lammermoor—by sixteen years. Stephen Lord conducted crisply, moving the orchestra along with requisite skill and Paul Curran wisely supplying a straightforward, traditional production. That said, the production was not slavishly period. In fact, Kevin Knight’s austere set was simply a Highland meadow tucked below Scottish crags (actually the Jemez Mountains seen in the distance to the rear of the open-backed stage). A great fissure ran the length of the meadow and opened to reveal Elena’s hut or at the finale, the throne room of James V. But most of the time, it was this simple heather strewn plain. The only odd bit was the Braveheart bravado at the end of Act I, where the Scottish Highlanders rush the stage, ready to do battle naked with blue face paint. I half expected Mel Gibson to join in, but nevertheless the Chorus of the Bards, with its Ossianiac references fascinated and the chorus as prepared by Susanna Sheston was excellent throughout. Staging Rossini’s opere serie, however, can be daunting, many calling for not one, two or three lead voices, but four or five. Such is the case here with two coloratura mezzo-sopranos, two coloratura tenors (both roles with high tessitura), and a great bass—doubtless explaining the infrequency with which we see this opera. However, the rewards are substantial, as La donna is filled with gorgeous music with spectacular ensembles—duets, trios and choruses—as well as big set-piece arias. Santa Fe had its hands full here and has certainly fielded singers of reputation and experience, but unfortunately did not quite achieve the uniformly fine line-up they had intended. I greatly anticipated hearing Italian mezzo Marianna Pizzolato as Malcolm, given her sensational 2006 live recording from the Rossini Festival in Bad Wildbad, Germany. There she gives a rendition of “Mura felici” with a touch of Horne’s characteristic smokiness of voice, but with a lighter cast. However, seven years later, her “Mura felici” was not so felice. That evening the mezzo’s passagework had none of Horne’s bite and her lower register was weak. Looking frumpy in her tartan drag (the costumes are just serviceable), Pizzolato did not cut the figure one hoped for visually or vocally. On the other hand, DiDonato is not obliged vocally to Horne, save the fact that the latter, perhaps more than any other singer, did more for the “Rossini Revival” in the 1970s and ‘80s and it is to Horne that we—and DiDonato—owe this repertory. Her Elena—the lady of the lake—was wonderful. DiDonato dominated the opera, from the beginning’s lovely picture as she alights from her boat to walk onto the heather strewn highlands to the evening’s final notes. The mezzo, having first triumphed in the role at the Paris Opera in 2010, brought her assured, supremely confident performance to Santa Fe. DiDonato as Elena gets to close the opera with the major set piece, “Tanti affetti in tal momento,” as she simply and humbly thanks Giacomo V for his generosity. DiDonato began the finale with nuanced singing and ended with blazing coloratura passage work with octave jumps and dramatic pauses towards the end of the phrase that finishes with “tanta…felicità,” “so much happiness.” She—like Horne decades before—brought down the house. Turning to the men of the cast, I had also looked forward to hearing Lawrence Brownlee again, having first heard him in the Metropolitan Opera’s first performances of Rossini’s Armida in 2010. Then I was concerned that his light tenor was undersized for the cavernous Met and reserved judgement. (For the record, Nick Muni scored a triumph with an imaginative North American stage premiere of Armida for Tulsa Opera in 1992, 18 years before the Met first assayed it as a vehicle for Renée Fleming.) Brownlee’s smallish tenor with a constricted top was once again in evidence in the first act. The good news, however, is that the voice opened up in the second act. He sang with more ease and resonance, and his most important aria—“La fiamma soave”—that opens Act II was well delivered. The surprise of the evening was René Barbera’s Rodrigo di Dhu (Roderick). As he first opened his mouth it was clear we had a real Rossini tenor on stage. He sang voice placed forward to achieve a penetrating sound but was never strident. The love triangle of Elena, Rodrigo and Uberto has a brief trio in Act II in which the two tenors repeat the other’s coloratura passagework. One couldn’t help but think they were competing in real life, as well as in the story for Elena’s hand. Barbera’s ringing tenor won. Despite the rivalry, both Uberto and Rodrigo lose the girl. Bass-baritone Wayne Tiggs as Elena’s father Douglas (Duglas d’Angus) was rock solid, a commanding voice and presence. He was best in the enchanting trio (“Quanto a quest’alma amante”) near the end of first act that combined the evening’s three best voices—Elena, Duglas and Rodrigo. One particular moment during the evening reminded me of why opera-going in Santa Fe is so very special. While Elena sang of her love for Malcolm, comparing it to a lightning bolt, actual thunder sounded in the distance. This production especially takes advantage of the opera house’s outdoor setting, transporting us back to the 16th century and the Scottish Highlands, fusing together it and present day New Mexico, collapsing time and space just for a moment. 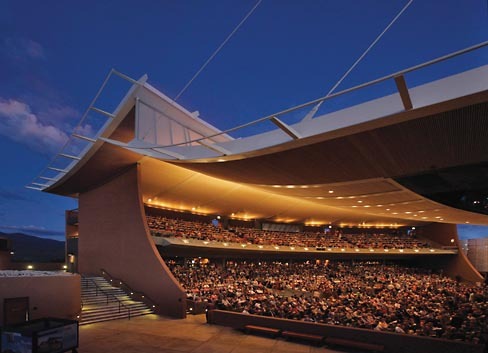 It will be interesting when La donna del lago alights at the Met to see how and if they can compensate for the natural beauties and special qualities afforded those of us within the “happy walls” of the Santa Fe Opera.